The season might be nearing its end, but Jose Miranda is playing like he wouldn't mind seeing it go on a little longer. Two days after homering in the semifinals, the Twins' No. 29 prospect went deep again as part of a two-hit night to lead Fort Myers to a 3-1 victory over Daytona in the opener of the best-of-5 Florida State League Championship Series on Friday at CenturyLink Sports Complex. "I feel like it was really important for us, it was a huge win," Miranda said. "It was the first one, so we had to get that one out of the way. The team played really well, we were doing the little things. I felt good hitting -- I felt pretty good and enjoyed the time." 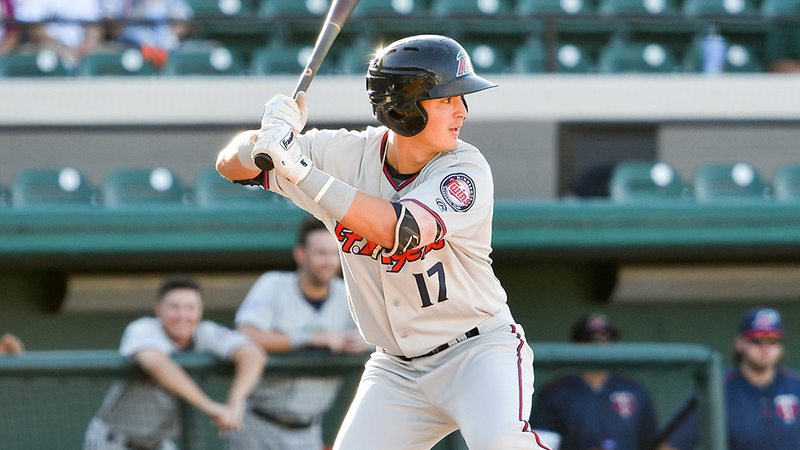 Miranda, who was promoted to the FSL on Aug. 6, hit .216/.292/.353 in 27 games with the Miracle after batting .277 with 36 extra-base hits with Class A Cedar Rapids in the Midwest League. However, the 20-year-old found a groove down the stretch, hitting safely in his final six games of the regular season. The hot streak continued into the semifinals, where Miranda went 3-for-8 with a homer and two RBIs in the two-game sweep of Palm Beach. He attributed his recent success to being more selective at the plate and hunting pitches he can handle. With Friday's game scoreless heading into the sixth inning, second-ranked Twins prospect Alex Kirilloff smacked a two-out single to left to set the table for the 73rd overall pick in the 2016 Draft. Up 1-0 against starter Packy Naughton, Miranda smoked a hanging off-speed offering over the left field wall for a two-run dinger. It was his second homer in as many games and third in four contests dating to the regular season. "I was looking for a bad pitch because they had a good sequence against me," Miranda said. "So I was kind of waiting for a bad changeup and they left it up and I had a good swing. ... [The dugout] was crazy and the team was really pumped up. And after that, everybody was rolling. Everyone was making good plays and we were doing the small things." Twins No. 18 prospect Travis Blankenhorn added some insurance with an RBI single in the eighth. Charlie Barnes (1-0) allowed seven hits and a walk with five strikeouts over 6 2/3 scoreless innings to earn the win. Jovani Moran gave up a run in eighth but worked out of a bases-loaded one-out jam to preserve the lead. He fanned six over 2 1/3 frames en route to the save. Getting out of that tenuous frame went a long way toward ensuring the win, Miranda said. "That was the best inning of the game," Miranda said of the eighth. "They loaded the bases and ended up only getting one run -- that was huge. Moran was making pitches that he wanted to. He was throwing his changeup -- his best pitch -- and he was locating it. He ended up getting the results and we ended up getting the win." Third-ranked Reds prospect Taylor Trammell drove in the Tortugas' lone run with a single in the eighth. Naughton (0-1) was saddled with the loss after yielding three runs on nine hits and a walk with three strikeouts over seven innings. Game 2 is Saturday in Fort Myers.